I received an ARC of [b:The Fifth Petal|29741905|The Fifth Petal (The Lace Reader, #2)|Brunonia Barry|https://images.gr-assets.com/books/1462933247s/29741905.jpg|50095716] without realizing, initially, that it was book #2 in The Lace Reader series and I found myself intrigued enough from the description that, upon that realization, I purchased a copy of [b:The Lace Reader|1951125|The Lace Reader (The Lace Reader, #1)|Brunonia Barry|https://images.gr-assets.com/books/1308969158s/1951125.jpg|3208367] from Audible. After finishing this novel I'm a little bit confused by the storyline, specifically after certain revelations towards the end which I won't disclose, but overall it was a very complex story with a lot of moving parts and different characters and at times I found it difficult to keep everything and everybody sorted and straight. I had to go back and reread several passages and paragraphs on more than one occasion throughout the book, however, that could be attributed to the fact that it was an audio book with so many layers to it. That's the only reason why I rated this four out of five-stars opposed to giving it a five star review but other than that minor complaint I really enjoyed this novel a lot. I've noticed a lot of negative reviews for [b:The Lace Reader|1951125|The Lace Reader (The Lace Reader, #1)|Brunonia Barry|https://images.gr-assets.com/books/1308969158s/1951125.jpg|3208367] on Goodreads which goes to show that you can't always go by the opinions of others because everyone's take is unique. I was especially attracted to the setting of this story, modern day Salem, Massachusetts, being a New England native myself and living just north of Salem in Portland, Maine I have visited the area several times and was therefore really able to connect to this story and visualize the different scenes. It even made reference to my home town of Portland and mentioned different landmarks that I frequently go to so that's always fun. This story is told from the point of view of Towner, the female protagonist who returns home to Salem after years removed when she gets word that her beloved aunt has gone missing. Tower comes from a long line of Lace Readers who are gifted with the sight and can see premonitions of future events, among other supernatural abilities and are thought of as modern day witches of Salem. When Towner returns she is forced to face her haunting past filled with tragedy and family secrets that have nearly driven her crazy. Meanwhile a cult of religious fanatics run by Cal, an abusive preacher who has brought nothing but pain to the women in Towner's family, herself included, remains a constant threat while a good intentioned detective, with demons of his own, tries to bring Cal to justice before he can cause any more pain and damage. This is a very diverse book with a few fantasy/paranormal elements, a bit of myself and suspense and also a romantic triangle, or quartet rather, thrown in to really thicken the plot. It's about relationships, family, loss and grief and mental illness and also addresses domestic violence and the patterns of abuse that a battered woman suffers. Somehow Brunonia Barry was able to weave all these complex themes together to create a beautifully written, creatively original and undeniably unique novel that I really enjoyed and highly recommend to all female readers of fiction. 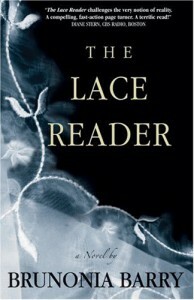 I'm very much looking forward to reading the second book in The Lace Reader series, [b:The Fifth Petal|29741905|The Fifth Petal (The Lace Reader, #2)|Brunonia Barry|https://images.gr-assets.com/books/1462933247s/29741905.jpg|50095716], in the very near future and I cannot wait to take another trip to Salem, Massachusetts.